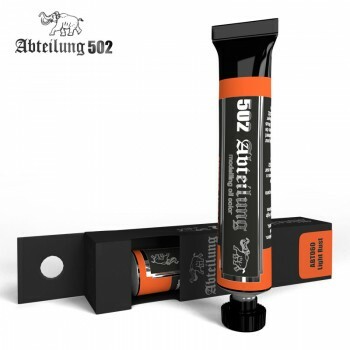 Abteilung 502 Light Rust Oil PaintThis Abteilung 502 Light Rust paint tube contains 20ml of high quality Light Rust coloured oil paint.Perfect colour to simulate light rust effects and also to work on metallic structures, exhausts, etc. It is recommended to combine with different rust tones to achieve more realistic finishes. Rust colours are indicated to apply washes on many parts of any vehicles, and thanks to the colour vividness of the oil paint, the results will be outstanding.